American hunger: It's embarrassing by rich-country standards. New York City residents at the Xavier Mission food pantry. During the recession, the number of Americans threatened by hunger skyrocketed. But during the recovery, as the U.S. Department of Agriculture reported yesterday, the number has barely fallen. All told, the government finds that more than 14 percent of households are considered “food insecure,” meaning they at least have difficulty affording meals, and in extreme cases may go without eating. To understand just how embarrassing America’s hunger problem is, it helps to put it in a global context. Unfortunately, according to the Organization for Economic Co-operation and Development, “there are no internationally comparable statistics on food insecurity that are as detailed as those of the United States.” However, there are some useful numbers available, thanks to the researchers at Pew and Gallup who have polled citizens across the developed world about whether they can afford enough food for their families. According to Gallup’s findings, cited by the OECD, Americans are far more likely to say they were unable to pay for food than citizens of other rich countries. In 2011 and 2012, 21 percent of U.S. citizens reported food trouble, versus 8 percent of British survey takers, 6 percent of Swedes, and 5 percent of Germans. 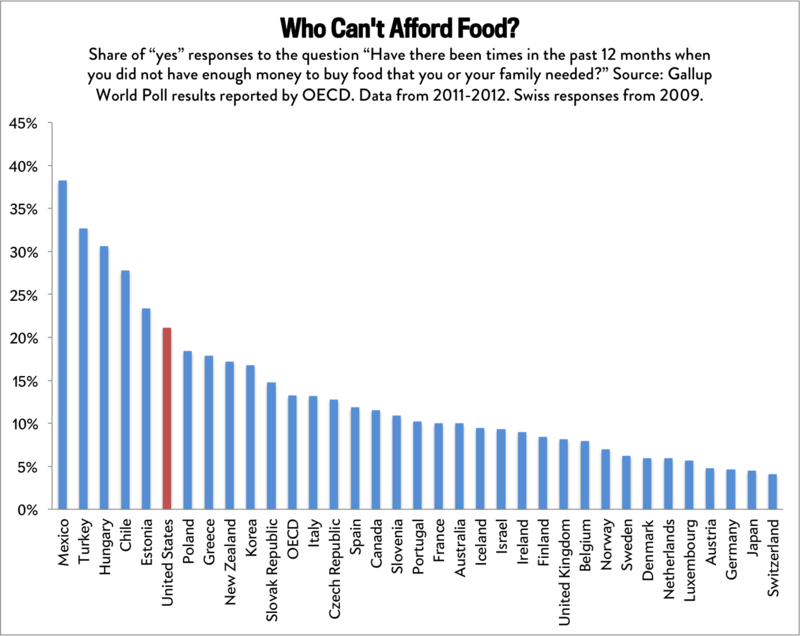 Estonia and Hungary had bigger problems with food affordability than the U.S., but both are relatively poor among developed nations. In an ideal world, we’d have more detailed statistics for each country, similar to what the USDA produces. Nonetheless, Pew and Gallup’s findings suggest that the U.S. could have one of the worst hunger problems in the developed world—and among rich countries, we might have the worst of all.